Lake Champlain is one of the best locations on this continent for studying the past 300 years of inland water transportation. The lake’s rich archaeological heritage can be attributed to two factors: its strategic location between the Hudson and St. Lawrence rivers, and the cold, dark, preserving conditions beneath the surface of the water. The maritime history of Lake Champlain can be divided into three eras: the era of military struggles and naval squadrons, the era of commerce and merchant fleets, and the era of recreational boating. The lake has been involved in three major conflicts between the 17th to 19th centuries. Skirmishing between Native Americans was transformed into a contest for the North American continent between France and England. This was followed by the American Revolutionary War in 1775 and the War of 1812. Years of conflict turned to bustling commerce in the 19th century. During this period the lake churned with the wakes of hundreds of merchant vessels of all descriptions: steamboats, canal boats, scow ferries, merchant sloops and schooners, horse ferries, tugboats, and untold numbers of lesser craft. The 20th century has seen Lake Champlain emerge, after a period of disinterest and neglect, as a center for recreation, for fishing, for swimming, and especially for sail and motor boating. Over the centuries, disasters large and small sent scores of vessels to the bottom. 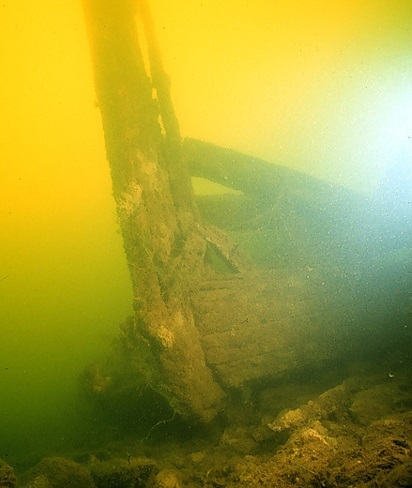 Sinkings were occasionally the result of dramatic naval battles or the ever-present hazards of collision, fire, and storm, but the greater number appear to have been the result of decay, neglect, and old-age working on the planks and frames of a wooden hull. Once a vessel went to the bottom, it entered what is essentially a cold, dark vault, ideal for the preservation of wood and other organic materials. Over the past twenty years researchers working for the Institute of Nautical Archaeology and the Lake Champlain Maritime Museum have been able to locate and study examples of nearly every type of vessel that ever floated upon Champlain’s waters. Arthur Cohn and Marshall True. “The Wreck of the General Butler and the Mystery of Lake Champlain’s Sailing Canal Boats,” Vermont History, Vol. 1, No. 1, 1992. Joseph Cozzi. “The North Beach Wreck: A Solid Wall of Timber,” the INA Quarterly, Vol. 19, No. 2, 1992. Kenneth Cassavoy and Kevin Crisman, “The War of 1812: Battle for the Great Lakes,” in George F. Bass, Editor, Ships and Shipwrecks of the Americas (London and New York: Thames and Hudson, Ltd., 1988). Kevin J. Crisman. “”Coffins of the Brave”: A Return to Lake Champlain’s War of 1812 Ship Graveyard,” the INA Quarterly, Vol. 22, No. 1, Spring, 1995. Eric Emery. “Whitehall Project 1995: A Preliminary Report on the Excavation and Study of the U.S.N. Row GalleyAllen,” the INA Quarterly, Vol. 22, No. 4, Winter, 1995. Erika Washburn. “Linnet: A Brig from the War of 1812,” the INA Quarterly, Vol. 23, No. 1, Spring, 1996. Kevin J. Crisman and Arthur B. Cohn. When Horses Walked on Water: Horse-Powered Ferries in Nineteenth-Century North America (Washington, D.C.: Smithsonian Institution Press, 1998). Ogden Ross. The Steamboats of Lake Champlain, 1809 to 1930. With new essays by Arthur Cohn. Reprint of 1930 edition by Vermont Heritage Press, 1997. ABOVE: The wreck of yet another luckless canal boat, sunk with a cargo of cut stone blocks off Diamond Island. 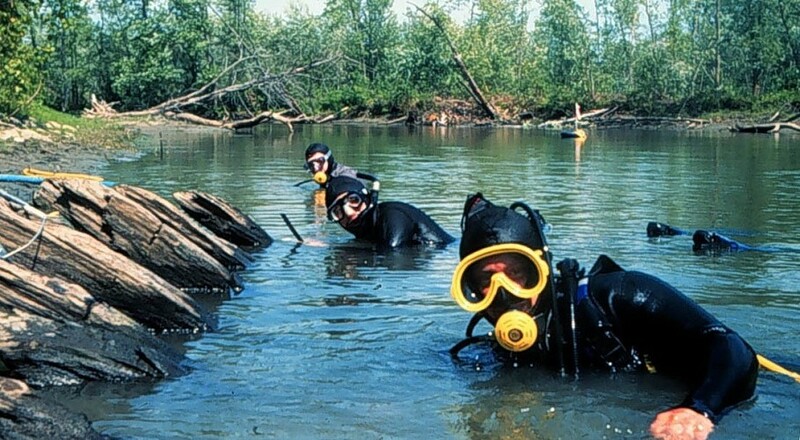 Despite their ubiquity (or perhaps because of it), the canal boat wrecks of Lake Champlain have undergone only limited archaeological study. 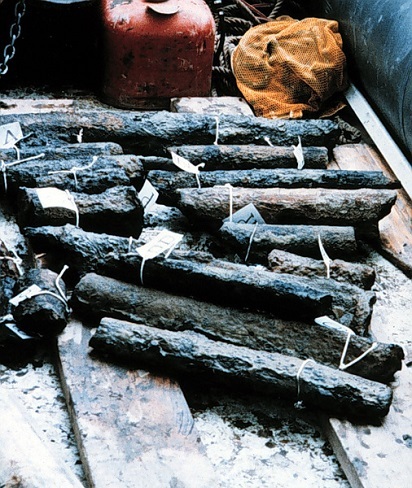 Right: The wreck of the Allen yielded a number of artifacts, including these bars of cast iron or ‘kentledge’ used for ballasting the gunboat.